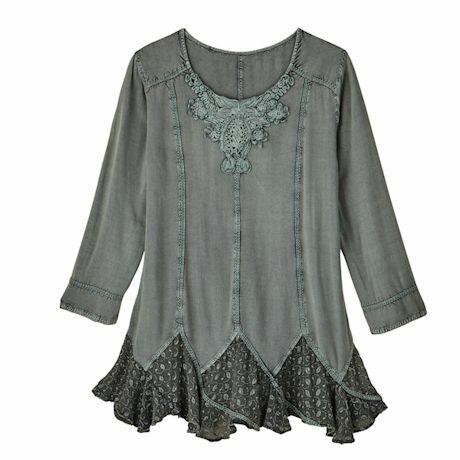 Bringing boundless personality to your look, this top has a lavish applique accent at your collarbone, plus adds a zig-zagged ruffle hem that swirls with every step. 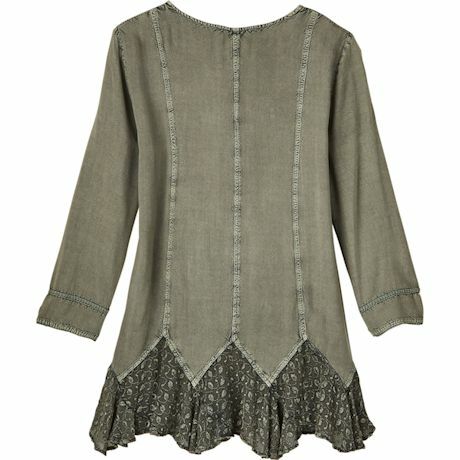 Overdyed for a chic monotone effect in a moss hue; ¾-length sleeves with soft cuffs. 100% rayon. Imported. S(6-8), M(10-12), L(14-16), XL(18), 1X(18W-20W), 2X(22W-24W), 3X(26W); 31"L. PLEASE NOTE THIS GARMENT IS RUNNING SMALL. BUST/CHEST MEASURMENTS (ONE INCH BELOW ARM HOLE) LS/34", M/36", L/38", XL/38", 1X/29", 2X/45", 3X/46"